“The Commission on Human Rights should investigate the plight of about 37 Mamanwa families now in Surigao City, “said ANAD Rep. Jun Alcover as he called on CHR Chair Etta Rosales to ferret out the truth and impose appropriate sanction on those responsible in the ‘forced evacuation’ of these indigenous people from Zapanta Valley, in Kitcharao, Agusan del Norte to Sitio Bacud, Barangay Luna, Surigao City. 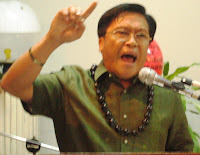 “While we welcome and support the move of the CHR to investigate alleged abuses by several mining companies operating in provinces of Surigao del Norte and Surigao del Sur, recent developments necessitate their intervention on the plight of the Mamanwas amid reports of admission by Bayan Muna Surigao del Norte Provincial Chairman Edgar Canda that he personally facilitated the transfer of these Mamanwas from Barangay Bangayan, Kitcharao, Agusan del Norte to Surigao City through Provincial Board Member Nilo Aldonza,” said Rep.
“Obviously the Mamanwas, led by a certain Gingging Anlagan, are manipulated and exploited by Maoist terrorist legal sectoral front political operators like Genasque Enriquez of Kasamang Lumad (KASALU) – Agusan del Norte,” he added. The ANAD solon expressed surprise when told that the Mamanwas were earlier temporarily resettled in Barangay Bangayan, Agusan del Norte after they left Zapanta Valley due to the encounter between elements of the 30IB, PA and the Maoist terrorist NPA, some 3 weeks ago, before they were brought to Surigao City. “I cannot understand why the haste in their transfer from Barangay Bangayan to Surigao City without the endorsement of both the local governments of Kitcharao and the province of Agusan del Norte, and without proper coordination with the office of Surigao City Mayor Ernesto Matugas. If there intention is clean and legitimate, they should follow proper procedures and not resort to shortcuts,” said Rep. Alcover. “I find it understandable when City Mayor Ernesto Matugas convened an emergency meeting of the City Peace and Order Council last Saturday (June 4) because indeed the dirty and vicious hands are too visible to be ignored,” Rep. Alcover stressed. “My experience in the Maoist communist movement clearly tells me that the innocent Mamanwas are more than ever exploited and used to advance the interest of the Maoist terrorist CPP-NPA-NDF,” he quipped.